First preheat your oven to 375 degrees. Then put 1/4 tbs of BuffBake on each piece of dough along with 3 thin slices of apple. 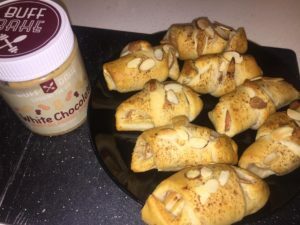 Then gently roll up your crescent rolls, top with cinnamon and sliced almonds, and place In the over for 11-13 minutes. Finally take out of the oven to cool and ENJOY!! Throw everything in a blender and blend until smooth. Then top with some fat free whip and enjoy!! Mix all ingredients in a bowl and mix until smooth. Then simply roll into balls and enjoy!! 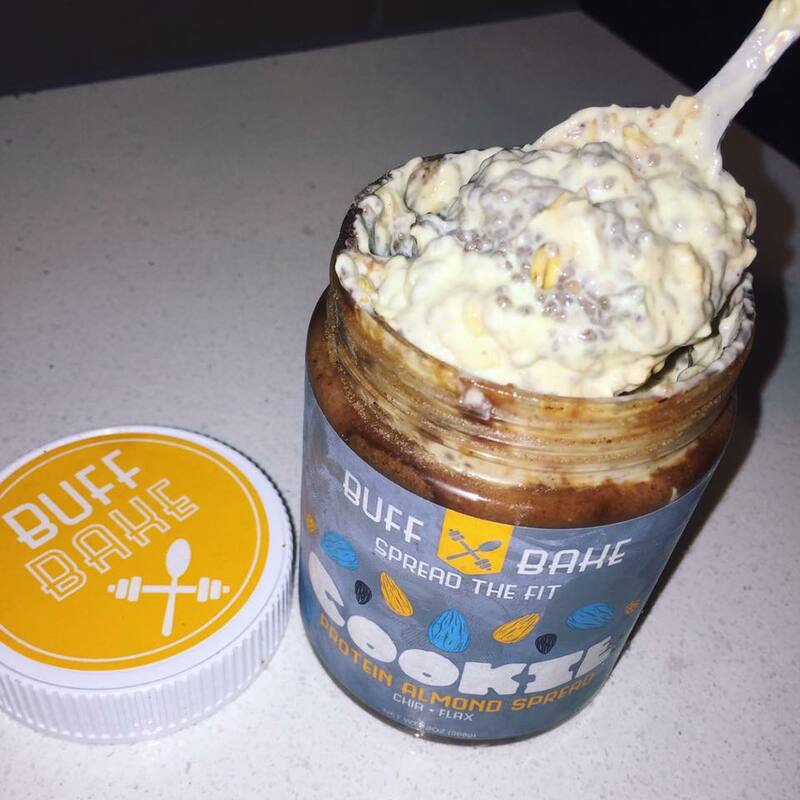 First take your jar of BuffBake and add your oats. Then you will layer on top the other ingredients starting with almond milk, then yogurt, and chia seeds. Finally store in your Fridge over night, mix in the AM and enjoy! This week the ADOFitness trainers will be addressing topics we get asked a lot of questions about. 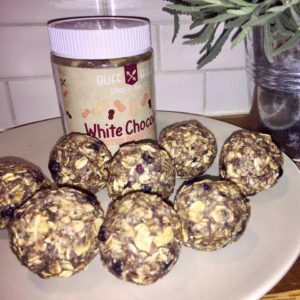 This week coach Tara discusses why keeping your sugar intake down is important for fat loss. This is a question I get asked a lot about, especially with clients wanting to start a flexible dieting plan. They see these people on IG chowing down on donuts and ice cream, and even ice cream filled donuts! They think, “Wow, now this is a plan I could stick too!” But flexible dieting isn’t all about how many donuts you can fit into your week, and keeping track of your sugar intake is still very important to not only fat loss but your overall health in general! Research has shown that people with a higher sugar intake are more susceptible to obesity, heart disease, diabetes, fatigue, high blood pressure, and cancer. So by eliminating a lot of processed sugars you are also lowering your risk for developing these conditions. If you are trying to keep your body in tip top shape and be the healthiest you can, eliminating more processed sugar is going to be important. Sugar is basically an empty calorie, as Im sure you all have heard before. It has also been known to have very little effect on satiety (how full you feel from the calories you eat) which in turn can make it very difficult to keep your intake down while working towards a fat loss goal. If you are in your off season, that is another story. You have more wiggle room with your macros being higher, which will allow you to fit in treats so much easier. If your macros are already getting low though the last thing you want to do is eat foods that won’t make you feel full and cause you to become ravenous (we’ve all been there). The best thing to do is to eat foods that are going to fill you up when your hunger is high. The best foods to chose would be low glycemic carbs, carbs that are packed full of fiber and will help keep you from feeling energy deprived. Sugar intake is all about balance. Having some sugar is definitely not going to kill you, but to much of anything can have negative affects. So try and keep in mind what your goal is and plan your day accordingly. Can you burn more calories by eating more frequently through your day? If you’ve been in the diet/fitness world for a little while, you probably will have heard about the Thermic Effect of Food (or TEF). Basically this means eating food burns calories because your body has to “work” to break the food down. You may have heard “10% of the calories you eat get burned” and “high protein diets are the best for fat loss”. But is that true for everyone/all the time? There’s more to the story. Especially if you’re relying on bars and shakes for your protein! TEF is the measurement of energy above your resting metabolic rate associated with the digestion and absorption of the food you eat. There are going to be important factors influencing how high this measurement rises overall. Because it’s not just in the first hour or so after you eat that your body is impacted by TEF, it’s over the next 5+ hours. TEF is even positively influenced by exercise, both resistance training and cardio. Higher protein meals ARE going to result in higher TEF, and in relation to exercise. 30% higher than a low protein meal in relation to exercise. And a low protein meal is going to have nearly 100% greater impact on your metabolic rate in relation to exercise verses not eating at all. Now, one important factor for TEF is your body composition. And I would also argue, gut health. Though the research studies don’t always agree across the board, common understanding of late is that the leaner a person is, the higher their TEF will be. But the favor is comparing a lean individual vs an obese individual. It’s not a specific to say, a competitor on-season vs off. Though many people find that anecdotally, they perceive a greater TEF and higher metabolism closer to show or their leaner state. One important factor to recognize than in MOST (not all) cases, a leaner individual will have healthier gut bacteria and digestive process as compared to an obese individual. See our previous @ado_fitness article on fiber for more Information on how digestion impacts body fat. I would argue the biggest factor in your TEF is going to be the amount of WHOLE FOOD in the meal. It’s been shown that the TEF for a whole food meal is close to 47% higher than a processed food meal. And that’s not even comparing eating a whole food meal like say, chicken and vegetables vs a protein shake. That’s comparing a whole food healthy sandwich vs a processed junk sandwich of similar macro structure. If you think logically here, your body must work a lot harder to break down whole foods than it would to absorb already broken down/processed sources. It’s fantastic to be able to work in “junk” or “treat” foods into your macros, you are sacrificing a certain amount of net calorie burn by opting for that meal vs a “clean” or “bro diet” meal. Not to mention, nutrient profile! – Your biggest factor is going to be total calories per meal. As the higher the total calorie intake of the meal, the higher the TEF. This may stand for an argument in favor of intermittent fasting for those who need to be on VERY low calorie diets for health reasons. – And finally, higher protein meals vs low protein meals. 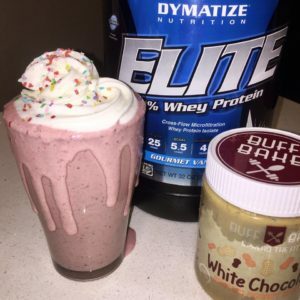 – Whole food, high protein meals are going to be the most satiating. So for those on calorie restriction, limit your liquid and processed meals. For those who struggle to be hungry enough to consume your protein intake requirements, use more liquid meals. This week the ADOFitness trainers will be addressing topics we get asked a lot of questions about. This week coach Joey discusses sodium. First of all let me start off by saying sodium is not a bad thing to have in your diet daily. In fact, not getting enough sodium can be just as harmful for you as eating too much. Your body needs sodium in order to function – it plays a vital role in regulating blood sugar, maintaining blood pressure, proper blood circulation, and plays a role in your bone density. With all of these positive benefits, it’s hard to believe that salt can actually be dangerous for you. Most people use common table salt to add flavor to their meals, but this is not true salt. Table salt is manufactured and processed; in order to make it, naturally occurring salt is heated to over 1200 degrees Fahrenheit which causes over 800 of the naturally occurring minerals to be lost. Many synthetic chemicals are also added to table salt, which in some instances can actually cause the salt to be toxic. Ingesting too much salt will cause a rapid spike in your blood pressure, can cause you to retain fluid, and can exacerbate chronic illnesses such as diabetes and gout. So how can you get your body’s daily requirement of sodium while avoiding all of the negative consequences? Instead of using table salt, use naturally occurring salt like Himalayan or Sea Salt. These kinds of salt are harvested and allowed to dry naturally in the sun, without adding any chemicals to them. It’s also important to track your intake of sodium. You can do this using a macro-tracking app, like MyFitnessPal or MyMacros. Every food you eat contains some sodium, especially processed foods, so adding even more may cause you to have too much in your diet. The American Heart Association recommends keeping your daily sodium intake under 2300 mg. However, everyone responds differently to different amounts of sodium ingested. If you think your sodium intake needs to be adjusted or have questions it is always helpful to have a coach to guide you along with a proper nutrition plan. This week the ADOFitness trainers will be addressing some of the most common things we get asked about. 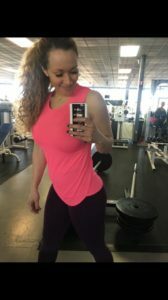 Coach Jennifer talks about what a keto diet is and the harmful effects that can be caused by it. What is a “keto diet”? It’s any extremely low carb diet that forces the body into ketosis. Ketosis occurs when people eat little to no carbohydrates and the ketones build up in their bloodstream. No carbs, cause sugar levels to drop and fat is broken down into energy. Ketosis is a mild form of ketoacidosis which is the leading cause of death with people with type 1 diabetes. There are many problems that can be caused with low-carb diets. With diets such as this, your veggie/grains/legumes/fruit count is really low ( on avg. 30-40 grams ) and without eating carbs you run the risk of getting too little of fiber. Without fiber you can get “backed up” because fiber allows more water in your stool which makes it easier for food to pass through and eliminate waste. Fiber also slows down the process of digestion keeping you fuller longer. Without fiber you’re most likely not getting enough nutrients since fiber foods like whole grains, legumes , fruit, and veggies provide you with healthy micronutrients. Besides those issues, Keto diets are not easy to sustain for long periods of time. Some studies have shown that one of the long term side effects is death! What may work for one person ( short term) can be extremely dangerous for another. Keto diets are basically implemented to lose weight fast but you need to keep in mind the logistics behind this initial weight loss. You’re depleting your glycogen stores when you’re not eating starchy carbs, causing less full muscle tissue and scale weight loss. And yes you most likely will lose some fat in the process of cutting calories through carbs but you can also become very carb sensitive. Then when you begin to add carbs back, your body will blow up and possibly gain all the weight you lost back- plus some. That’s why @ado_fitness believes in a well balanced diet being better for long term results and sustainability🙏🏼 Think about it, are you really not going to eat carbs the rest of your life?